As I am about a month into college it is natural for someone like me to be completely obsessed with their school. No curfews, no parents, plenty of parties are a few of the many reasons your average 19-year-old is living it up at their new home away from home. However, I’m convinced Texas Christian University is the best college in the country. Now, if you’re going to another school you’re probably annoyed that I’m going to spend a whole blog post bragging about my university, if that’s the case, sorry ’bout it. If you happen to be in high school and are currently in the application process, stick around and listen to what I have to say. Here is my list, in no particular order, of why TCU is the best school ever. The dorms should hardly even be considered “dorms.” I like to consider them small hotel rooms you get to share. My dorm has plenty of room and I have a lot of things. If you look at the sophomore dorms (sophomores are required to live on campus too), you’ll think you just walked into a chic loft made for someone with a degree and money. The sophomore dorms are nicer than sophomores even deserve. Big spirit, not-so-big school. Being in the Big 12 Conference everyone assumes we have a “Big 12” student body. Wrong. With only 8,000 undergrads, there’s no getting lost in the crowd. It’s impossible to walk to class without seeing someone you know (even for me who’s an out-of-stater). The community is close thanks to programs such as Frog Camp and Hall Crew. Even though there isn’t a huge student body, the spirit is still there. Purple covers the campus, the surrounding neighborhoods show their school pride, everyone “throws the frog,” and shouts of “RIFF RAM” can be heard if you listen closely. The classes are actually interesting. These college classes aren’t a snooze-fest. If you were to go to a large state school, you would have TAs (teacher’s assistants) instead of professors and would be stuck in 400-person lecture halls all day. At TCU? Not the case. I learn directly from my professors (most of whom have their doctorates) and 4 out of 5 of my classes have about 40 students in them. Not only does this keep it more interesting, but it enables you to make a personal connection with your professors so you can talk with them and ask questions because surprise! they want you to succeed. The one lecture I have this semester is in the largest lecture hall on campus which maxes out at about 150 students. Not. Huge. At. All. While my classes are general, freshman classes, they’re still interesting. These professors love what they teach, and you can tell. The food ain’t half bad. In the BLUU (Brown Lupton University Union) there are so many selections for every meal it’s hard to choose. Want healthy-vegetarian-gluten-free food? They have it. Want a hefty piece of pizza with some fries? Stir fry? Grilled chicken? A smoothie? A wrap? They have it all. I could probably get something different for lunch and dinner every day for the whole year. In addition to the endless selections at the BLUU, there is a mini Chickfila on the first floor and Union Grounds which has a Starbucks and even more selections to choose from including my favorite: sushi. Needless to say, I’ll be needing to make a trip to the Rec very soon. 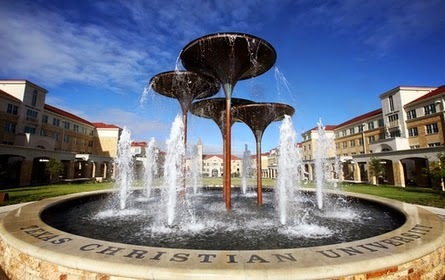 I could go on all day about how awesome TCU but I’ll leave it at that and you can come down here and see for yourself. I’ve heard its impossible to visit and not want to come to this magical place I call home. And I believe it. Book a trip here and I will personally give you a tour (I promise). Hope everyone’s school year has started just as great as mine!